I have learned to look for the encouragement and exhortation of Christ Jesus to live the Way of Truth that is Life in any and all circumstances I encounter. Examples of going eye to eye with what others deem a losing proposition; an exercise in futility; an irrational refusal to face facts; a behavior that will be an affront to those we seek to enlist; and an embarrassing display of supposed lone rangerism, nourish my soul and remind me that the impossible is possible and the truth will prevail in the in the long run in the face of cowardly behavior and selling one’s soul for the sake of approval which will wither and perish in the heat of true wisdom. These people remind me that the right path may be the path that only one will take and in doing so incur the wrath of those who have sold out to business as usual for the sake of pretending to be something that they are not. I am inspired by those who have a fire in the belly that drives them to paddle against the Tsunami and live in harmony with their deepest convictions. In the face of such courageous displays of allegiance to the truth regardless of the cost I must repent to my own unwillingness to do the same within the realm of my struggles. Bravo to the courageous few (or the one) who hold fast and take a stand for the truth and the way of truth in any and all facets of life. Today’s gospel reading in the Revised Common Lectionary (Luke 16.1-13) is one of what I would call, the hard sayings of Jesus. When I say hard sayings I do not mean hard in the sense of challenging to live out. Rather, I mean hard to understand. Hard to come away with anything but a confused and bewildered look on our faces. Jesus seems to be commending dishonesty. Surely not… And, in fact, you would be right. Jesus is not encouraging us to cheat. So, what way of relating to the circumstances of everyday life is Jesus encouraging us to adopt? Rather than attempt to articulate it myself, let me commend the reflection that can be found here. I do, however, want to point out what I believe to be another underlying theme of Jesus’ teachings that this parable reiterates. I cannot count the number of times I have had conversations with believers about their reading of Matthew 6.25-34 in which Jesus commends us to entrust the future to Him and His faithful provision. People end up struggling with that passage. Why? I am convinced it is because they (me too) tend to treat the meaning of so many passages as if they are “either/or” statements. Many of the things Jesus taught are misunderstood using this kind of approach exclusively. (Parenthetically, let me assure you that I realize there are statements that MUST be understood as “either/or”.) There is an appropriate “both/and” way of embracing what Jesus was saying on a number of occasions. What Jesus was teaching does not disallow a certain kind of subtlety that challenges our way of approaching the navigation of everyday circumstances. It invites us to respond as a result of looking “into” rather than “at” things. The kind of subtlety I am referring to can be found in many of the strange sayings in the wisdom literature of the Old Testament. The gospel for today is a good example. It is VERY subtle. It can be harvested with patience and more of the “both/and” approach we find in the wisdom literature of the Old Testament. Proverbial wisdom and the prudent behavior that results from it are not antithetical to the gospel. They are one aspect of the mysterious depth and applicability of it to our everyday life, filled with circumstances that require a subtle approach rather than a “it is what it is” approach. 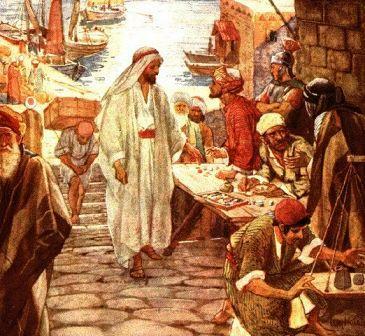 As Jesus passed on from there, he saw a man called Matthew sitting at the tax office; and he said to him, “Follow me.” And he rose and followed him. What I love about this passage is the complete representation of what has occurred in the life of Matthew. What has happened is not just spiritual but also physical. It portrays the union of spirit and matter, of commitment to the Lord Jesus accompanied by a corresponding commitment to a changed way of living. Jesus knocks at the door of Matthew’s heart. Matthew opens his heart and invites the Lord into it. In turn Jesus invites Matthew into his Way of Life and Matthew enters in. Likewise, Matthew invites Jesus to a banquet at his home (his life). He is not afraid of “going public” about his commitment. The Lord is willing and enters in. Notice that the passage then seems to take a mysterious turn. Let me point to it by asking, “Whose is the host of the banquet at Matthew’s home?” Jesus sits at table with Matthew – Matthew is Jesus’ host. But notice that in the same verse it says, “…many tax collectors and sinners came and sat down with Jesus…” The implication seems to be that the banquet starts out being Matthew’s and ends up being Jesus’. The union of the heart of God and the heart of men and women corresponds to the union of the common life of God and the common life of men and women. The heart into which the Lord is invited ceases to be the disciple’s heart. It becomes the temple/palace of the master into which He invites and entertains “all sorts and conditions of men.” Likewise, the life into which a person invites the Lord ceases to be his or her life (see 1 Co. 6.19-20). It becomes the physical temple/palace of the Master where not only the person’s life is changed but those who are invited into it are saved. I remember a course that was taught at the seminary I attended entitled, “The Bible and The New York Times.” The intention of the course was to provide an opportunity to struggle with the intersection of real life and the believer’s commitment to live out the Gospel in this world. Tough… Easier to occupy one world or the other. But, to occupy two worlds at the same time?! Thorny (allusion to the crown of thorns is intended). The ways of the Kingdom of God seem like and are considered foolishness, naïveté, a waste of time and energy, and of no useful effective, and, in fact, are seen and labeled as counterproductive to all who live according to the standards of this world. And vice versa. The two kingdoms are not compatible. The Scriptures are clear on this point. All would be well if that were the end of it. One kingdom would just demolish the other one. But, wait. Not so fast. But, the very same Scriptures commend us to live fully in this world and yet not of it. What?! That cannot be right. Jesus is not entering the Holy City on a white charger. He is not defending himself. He is not calling down legions of angels to destroy this world. He is dying on the cross. He seems to be alluding to some kind of redemption or recreation of it by embracing it with love. The Word of God. Only in the footsteps of God will he proceed. The Word of God. The Word…. Proceed in the footsteps of the Word. The name of God…. Jehovah…. To do the impossible by the grace of God – to live in this world and yet of the Kingdom of God. But that impossible possibility brings another challenge. It is the definite possibility, (dare I say certainty?) of being ostracized by those in both “kingdoms” who opt for their “kingdom” to the exclusion of the other as the life-giving way to live. Here are some passages and a reflection from Thomas a Kempis that might assist you in your reflection on this “thorny” path (pun intended). 3. “I,” saith the Lord, “taught the prophets from the beginning, and even now cease I not to speak unto all; but many are deaf and hardened against My voice; many love to listen to the world rather than to God, they follow after the desires of the flesh more readily than after the good pleasure of God. The world promiseth things that are temporal and small, and it is served with great eagerness. I promise things that are great and eternal, and the hearts of mortals are slow to stir. Who serveth and obeyeth Me in all things, with such carefulness as he serveth the world and its rulers? And if thou reason seekest, hear thou me. 4. “But, O shame! for an unchangeable good, for an inestimable reward, for the highest honour and for a glory that fadeth not away, it is irksome to them to toil even a little. Be thou ashamed therefore, slothful and discontented servant, for they are found readier unto perdition than thou unto life. They rejoice more heartily in vanity than thou in the truth. Sometimes, indeed, they are disappointed of their hope, but my promise faileth no man, nor sendeth away empty him who trusteth in Me. What I have promised I will give; what I have said I will fulfil; if only a man remain faithful in My love unto the end. Therefore am I the rewarder of all good men, and a strong approver of all who are godly.